The Northeast is bracing for its second winter storm in a week after one that hit Friday caused the deaths of at least nine people and left hundreds of thousands without power. Other parts of the world are meanwhile coping with their own extreme weather, such as Australia's record-breaking heat earlier this year and a sub-zero freeze in the U.K. The next winter blast in the Northeast U.S. is expected to strike Tuesday night as a storm from the Midwest moves in, with a winter storm watch in place for much of the Northeast from Pennsylvania to Maine. 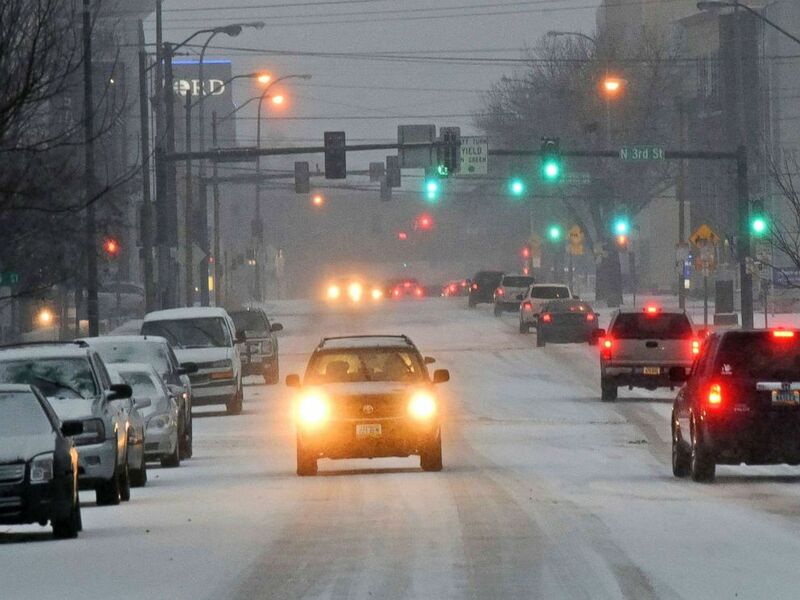 Traffic moves down a snow covered street in Bismarck, N.D., March 5, 2018, as snow falls. 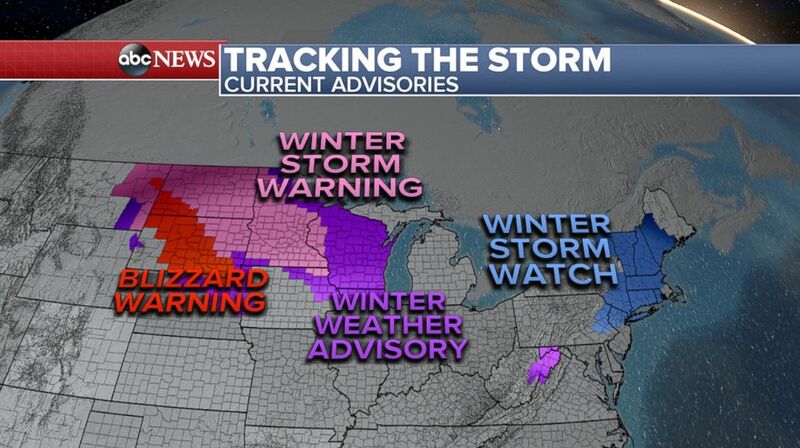 In fact, 20 states from Montana to Maine are under winter storm alerts, which means that 50 million Americans are in the path of heavy snow and strong winds conditions today through Wednesday. The forecast shows around 6 to 12 inches of snowfall for the areas under blizzard warnings in the Plains and through parts of the Northeast. 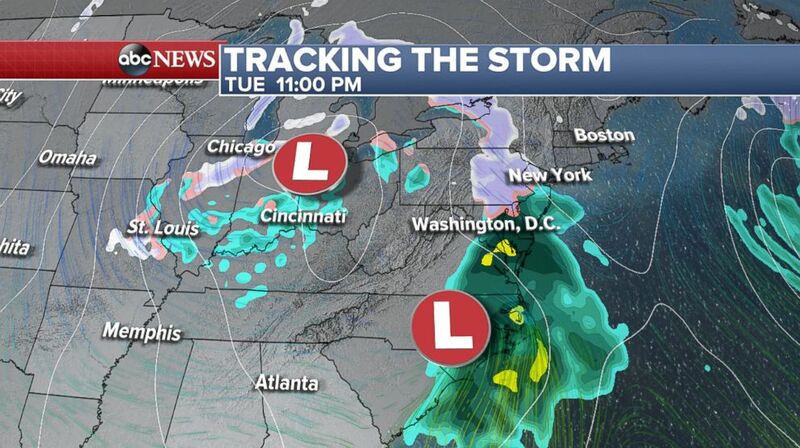 The storm developing in the Midwest is expected to meet a coastal low, which will form off the Mid-Atlantic and move up the coast bringing snow and rain, and may help form a nor& #039;easter over the East Coast when they meet on Wednesday. Twenty states from Montana to Maine are under winter storm alerts and 50 million Americans in the path of heavy snow and strong winds Monday through Wednesday. 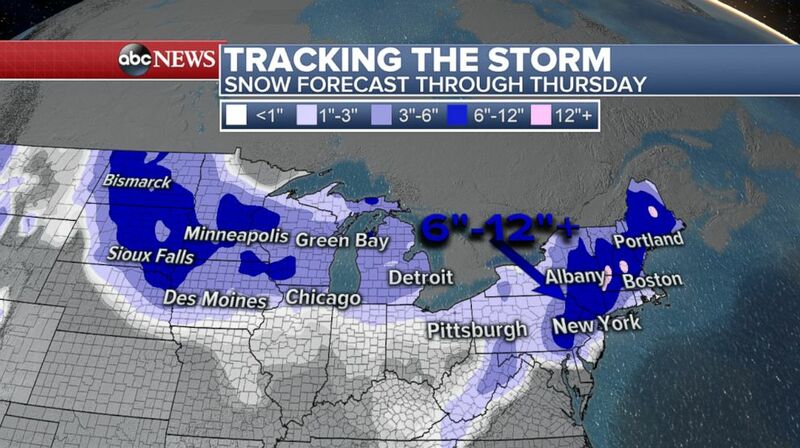 Snowfall of 5 to 9 inches is forecasted for some places in the Northeast, with up to a foot in isolated areas. 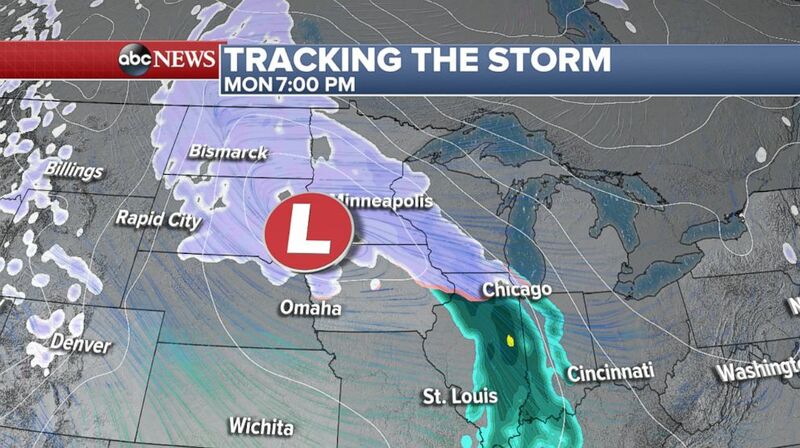 A storm system is over the Plain s and Upper Midwest tonight with snow and gusty winds stretching from Bismarck to Minneapolis to Chicago with 6 to 12 inches of snow possible. The winter storm watch follows a norâeaster that pummeled the East Coast Friday, but this potential norâeaster is not expected to bring as much coastal flooding and wind as the weekend's storm. On Tuesday, the storm will weaken as it moves across the Great Lakes while a coastal low forms off the Mid-Atlantic before the systems come together on Wednesday. 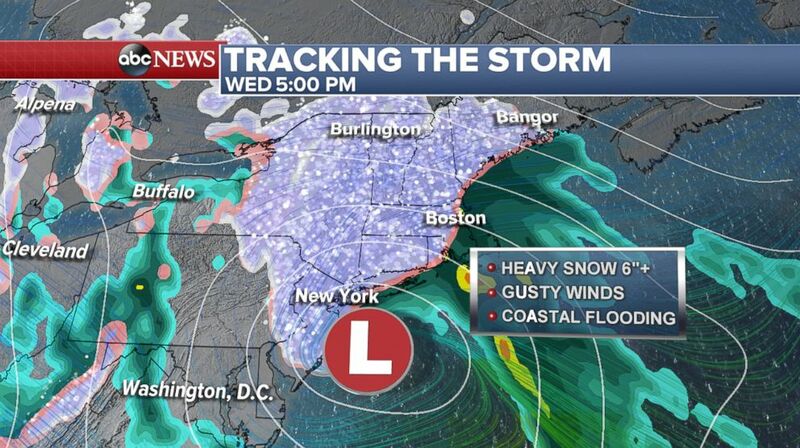 Wednesday the storm from the Midwest and the coastal low will come together to form a nor'easter that will impact the Northeast region from Philadelphia to NYC to Boston. Sydneysiders cool off at Tamarama Beach on Feb. 28, 2018 in Sydney, Australia. Almost exactly on the other side of the world, Australia is still experiencing hot temperatures after near record-breaking highs in Janu ary that sent beachgoers scrambling for shade and water. According to the Australian government's Bureau of Meteorology, Perth, a large city on the Western coast of the continent, may experience highs of 36 degrees Celsius, or 96 degrees Fahrenheit, on Tuesday and 32 degrees Celsius, or 92 degrees Fahrenheit, on Wednesday. 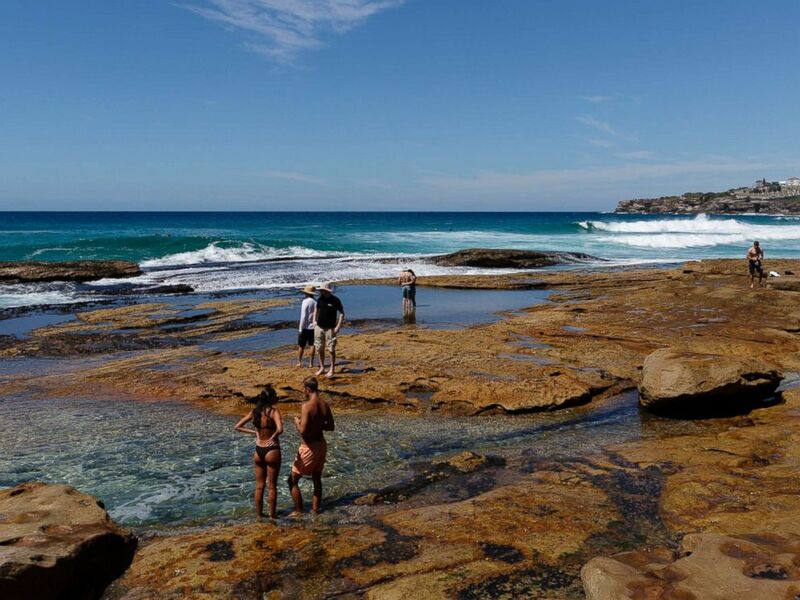 During January's heat wave, the temperature in Sydney hit an almost 80-year high of just over 47 degrees Celsius, or 117 degrees Fahrenheit. People were told to limit their time outdoors because of air pollution and to drink more water, and a ban was placed on outdoor fires. Thousands were left without power during the heat wave. 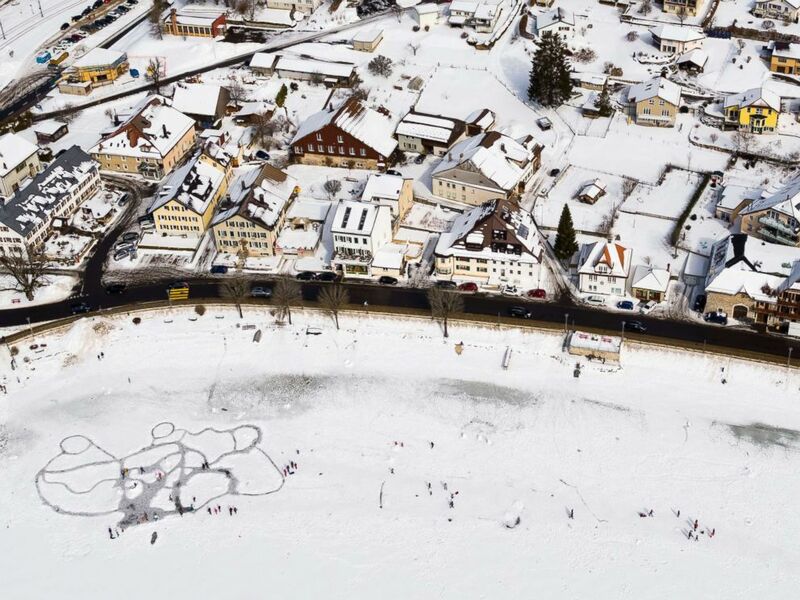 A picture taken with a drone shows people walking on ice paths carved through the snow on the frozen lake 'Lac de Joux' after a series of cold days in Le Pont, Western Switzerland, March 4, 2018. Across the pond, the U.K. and its neighbors endured an extreme and deadly cold snap accompanied by a blizzard over the weekend that closed airports and left hundreds of drivers stranded on highways in Scotland, Switzerland, Ireland and France. A farmer makes her way through heavy snow in Blessington, Ireland, March 5, 2018. Ten severe weather warnings were issued in the U.K. with travel warnings, cancellations of flights and trains, and closures of numerous roads and thousands of schools. 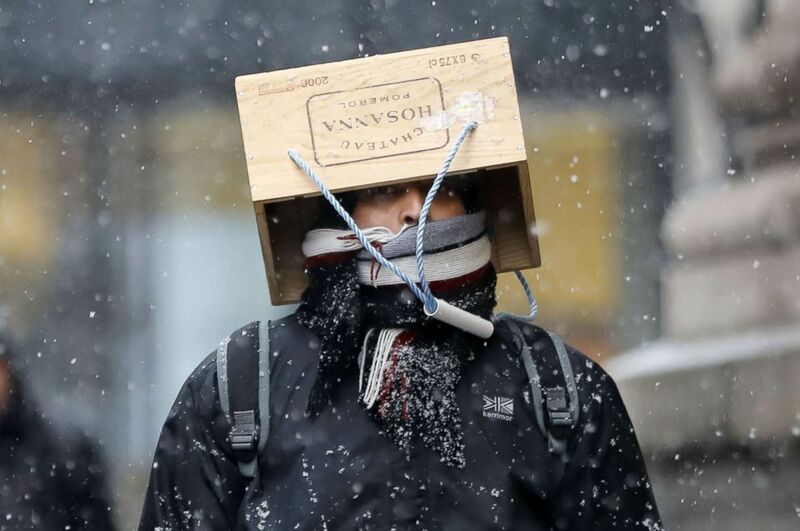 A pedestrian wearing an unusual hat walks through the snow as a blizzard hits central London, March 2, 2018. 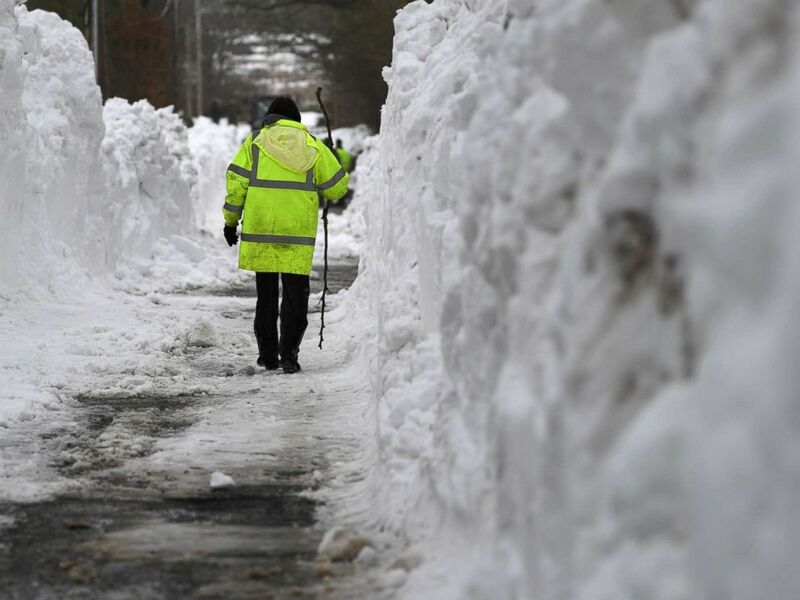 Heavy snowfall left residents across Europe trudging through the deep snow over the weekend, but even before the latest weather system, the U.K. had been attempting to recover from "the beast from the east," the nickname for a severe storm that struck the country last Wednesday. 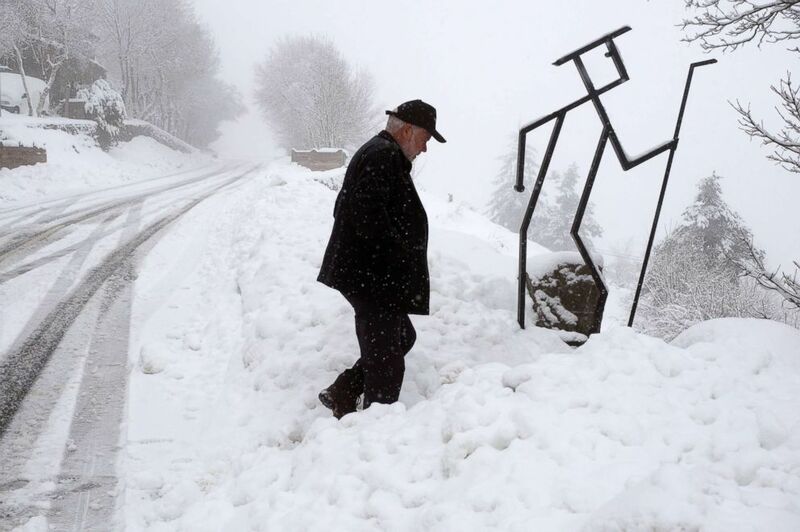 A man walks through the snow in Pedrafita do Cebreiro in Lugo, Spain, March 5, 2018. According to the U.K. 9;s weather office, an alert was issued last week for Scotland warned that there would be heavy snow and strong winds that would be threatening and disruptive to life.